An estimated 899,168 of Indiana’s 6,634,007 residents were living in poverty in 2016, which works out to around 14 percent of the state’s population. When in dire financial need, some Hoosiers might be tempted to turn to payday loans, and while these risky loans are indeed legal in Indiana, taking them out can quickly lead to crushing debt. With a little knowledge of how payday loans and title loans work in Indiana, Hoosiers who need a little cash injection can avoid being trapped in an endless cycle of debt – simply by making better choices. Payday lending is legal in Indiana per the Indiana Uniform Consumer Code (Ind. Code § 24-4.5 et seq.). Indiana residents may see many lenders dotting the landscape of their state, but they have it better than most Americans. Indiana is ranked 40th out of 50 when it comes to number of payday lenders per 100,000 residents. As such, it’s far easier to find a drive-thru Big Mac than a payday loan in Indiana, with one McDonald’s per 18,657 residents and one payday lender per 52,083 residents. Although payday lenders are relatively rare in Indiana, they’re still legal, a fact which makes them a tempting proposition for Hoosiers in a financial jam. In order to receive a payday loan in Indiana, the borrower must give the lender a post-dated check for the amount of the loan, plus the loan fee. In exchange, they get the cash they need upfront. After that, the borrower must either back the loan with the fee within 14 days, allow the check to be cashed, or ask to roll over the loan for another 2 weeks – and pay yet another fee. These fees add up, and borrowers can quickly find themselves in a cycle of debt, as lenders hand them increasingly larger shovels and watch them try to dig themselves out of a quickly crumbling pit of debt. The average payday loan in Indiana is for just $317. While that amount is relatively low, it can balloon into a debt of thousands of dollars if borrowers roll their loans over multiple times before paying them off. Sadly, this all too common in the Hoosier state. The average payday borrower in Indiana takes out ten loans a year and spends 5 months in debt, and 60% of borrowers take out another loan the same day they pay off another one. Payday lenders first popped onto the scene in Indiana in the mid-1990s. In 1993, the Indiana Department of Financial Institutions was created to oversee more traditional banks and small lenders, and was eventually expanded to include oversight of the payday lending industry along with pawn brokers and industrial lenders. The Indiana State Legislature had already codified its own version of the U.S. Consumer Credit Protection Act in 1971. The state then introduced a loansharking statute (Ind. Code §35-45-7) that made it a felony to charge an interest rate of more than 72%, or double the 36% APR cap laid out in Ind. Code §24-4.5. So how is it that we see a payday loan APR of 391% in Indiana? Back in 2001, even the Indiana Supreme Court was puzzled by this. That year, the Court ruled on two cases that pitted payday borrowers against payday lenders: Fast Cash USA, Inc. and Advance America Cash Advance Centers of Indiana. The Court decided that payday lenders are subject to those statutes limiting the APR of small loans. “We are required to determine and effect the legislative intent underlying the statute and to construe the statute in such a way as to prevent absurdity and hardship and to favor public convenience,” the Indiana Supreme Court decision read. “To interpret the statute as Lenders suggest—allowing a minimum finance charge of $33 for a loan that otherwise would generate what amounts to pennies in interest—is inconsistent with the purposes and policies of the IUCCC and creates an absurd result which the legislature could not have intended when the statute was enacted or when the various amendments were adopted,” the decision continued. So what happened? Why are payday lenders still able to squeeze out more than five times the APR that is considered to be criminal loansharking in the state? In 2002, the Indiana General Assembly effectively overrode the State Supreme Court decision with new legislation that exempts payday lenders from the 36% APR cap. Since then, it’s been open season on cash-strapped Hoosiers. The Consumer Finance Protection Bureau (CFPB), which was created by the Dodd-Frank Act in 2011, was supposed to reduce predatory lending through increased regulation. However, regulations put in place by Dodd-Frank and the CFPB are at risk of disappearing altogether due to the CFPB’s uncertain future. Indiana is playing a big role in this deregulation: a Democratic senator from Indiana is co-sponsoring a bill in the U.S. Senate that would roll back many of the regulations implemented by Dodd-Frank. Proponents of this deregulation claim it is an effort to promote lending by smaller financial institutions. But the new bill would not include a popular amendment that allows consumers the right to band together to bring class action suits against banks and credit card companies. More recently, payday lenders and their lobbying groups have been pressing the Indiana State Legislature to pass legislation that is more favorable to lenders—to the extreme disadvantage of consumers. In January 2018, a bill was introduced into the State House that would have created a new class of payday loans greater than the $550 current maximum amount these lenders can offer borrowers, and with terms from 90 days to 12 months and annual interest rates of up to 222%. These loans would range from $605 to $1,500. The bill passed the Indiana House in a vote of 53-41, raising concerns from consumer advocacy groups. “These high-cost loans have devastating consequences for borrowers,” said Steve Hoffman, president and CEO of Brightpoint, a Fort Wayne-based non-profit, in a statement to Indiana Public Media. Luckily, the bill looks to be dead in the Indiana Senate. Another bill recently introduced would try to once again cap payday loan APRs at 36%, as was intended by the Livingston decision in 2001. Unluckily, that bill didn’t even receive a hearing, even in the face of overwhelming voter support. No matter how insistent payday lenders are that they are simply offering a service to the community, the truth is that they are profiting enormously off the backs of the people who are most in need of access to small loans. 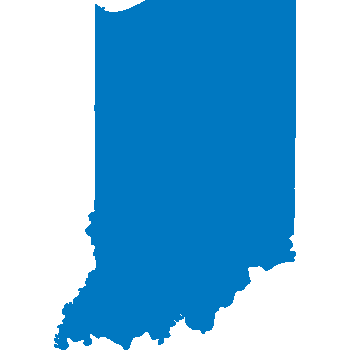 In Indiana, 1.2 million payday loans were made in the 12 months from December 1, 2016 to November 30, 2017. Hoosiers are lucky in that Indiana payday lenders cannot have borrowers arrested for nonpayment. They can’t seek treble damages in court. And they can only try to squeeze an extra $25 out of you for a check that bounces or an account that has insufficient funds when the lender tries to collect. However, they can still make your life miserable. Take the case of an Indianapolis man who took out a $400 payday loan to pay a bill, ended up $12,000 in debt, and eventually had to file for bankruptcy. Like payday loans, title loans are also meant to be short-term cash loans. 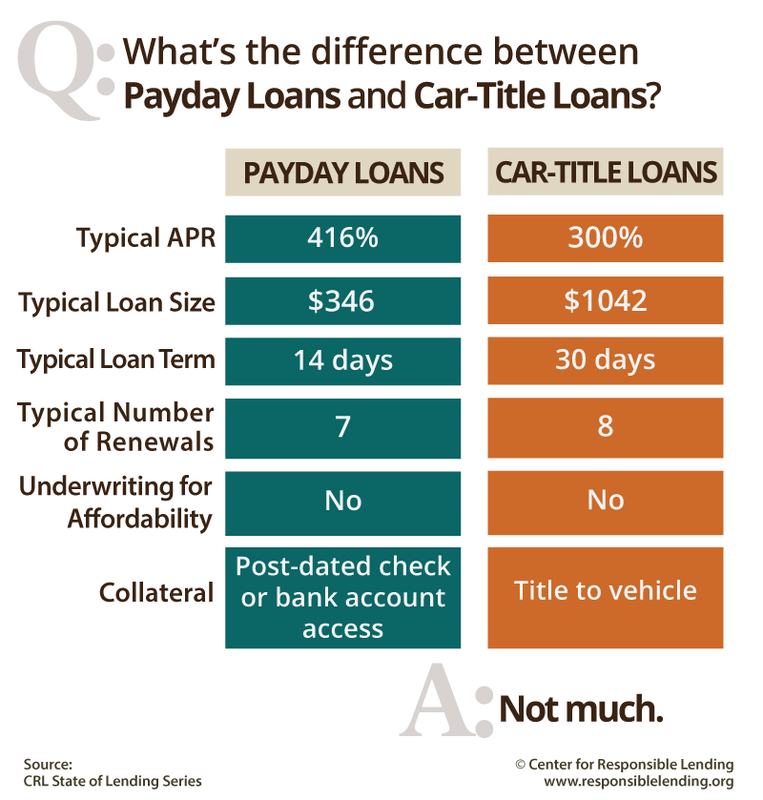 But while the typical APR for a car title loan (300%) is lower than that of a payday loan (416%), title loans are typically much larger, with a longer minimum length (30 days). In a car title loan, the borrower puts up the title to their vehicle as collateral. This allows borrowers to gain access to more money, but could also put them in a bad spot. If a title loan borrower is unable to pay back their loan on time, their options are limited: either take out another high-interest loan or potentially lose access to their vehicle. It’s a lose-lose situation. Nationally, about one in five title loan borrowers lose their cars. Some more good news for Hoosiers, though: title loans are prohibited in Indiana. The Center for Responsible Lending estimates that Indiana has saved $122,076,574 in car-title fees, thanks to its restrictions on this type of lending. While Indianans may be safe from the scourge of the predatory title lender, the state’s next-door neighbor, Illinois, does allow companies to operate as auto title lenders. In an attempt to prevent predatory lenders in Illinois from taking advantage of Indianans, Indiana passed a law in 2007 making it compulsory for out-of-state lenders to adhere to Indiana’s restrictions on title loans when these loans are being offered to Indiana residents. The law attempted to enforce an APR cap of 36% on all title loans. In 2010, this law was struck down by a federal court after Midwest Title Loans, an Illinois loan company, sued the state. 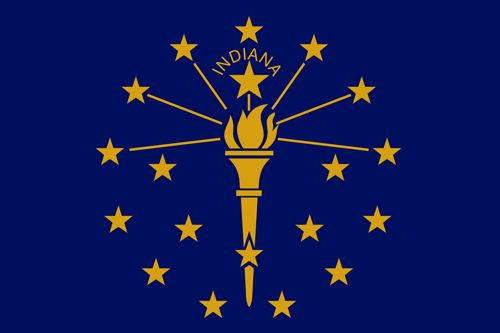 In Midwest Title Loans, Inc. v. Mills, which named Indiana Department of Financial Institutions as the defendant, the U.S. Court of Appeals, Seventh Circuit found that Indiana could not “take the commercial speech that is vital to interstate commerce and use it as a basis to allow the extraterritorial regulation that is destructive of such commerce,” citing a case involving a South Carolina truck company and Volvo Trucks of North America. As it stands, desperate Hoosiers can now head across state lines, where they can expect to get a loan with both an APR around 300% and run the risk of losing their vehicle or being trapped in a seemingly endless cycle of debt. The outcome of the Midwest Title Loans case means that while businesses operating in Indiana cannot extend title loans, Hoosiers can still receive this kind of loan if in need, by going to an Illinois-based company. In fact, Illinois title lenders reach out to Indiana residents with ad campaigns that range from flyers to radio and television campaigns, which Indiana attempted to use as evidence that Illinois title lenders should have to conform to Indiana loansharking laws. If you’re a Hoosier who has decided to engage in this extremely risky borrowing behavior, Illinois does have some regulations on title loans. While there is no limit to the interest that can be charged on this kind of loan, the principal amount borrowed can’t be more than $4,000, and the interest charged is simple interest—they can’t charge you interest on your interest. Furthermore, your monthly payment can’t be more than half of your monthly gross income, and the payments all have to be roughly equal—no balloon payments. However, instead of resorting to title loans, Indiana residents would be better served by credit counseling, emergency assistance programs through outreach organizations, an advance from an employer, or a safe online installment loan. Some predatory lenders may follow the letter of the law, but the interest rates they charge can be up to five times what would result in a felony loansharking conviction for another type of lender — we’re talking interest rates that are effectively as high as 390%. If you’ve gotten in over your head and feel that predatory lending practices are to blame, you do have options. You can contact the Indiana Department of Financial Institutions (DFI) and lodge a complaint. While the DFI doesn’t have any legal authority, they can put you in touch with organizations that help Hoosiers who have been the victims of predatory lending. The key to any fight against a predatory lender is documentation. Keep records of every interaction, every payment, every scrap of information. Even keeping notes on phone calls is helpful. And for other relief, you can reach out to organizations in your community, like the Indianapolis Legal Aid Society, which serves all of central Indiana. In 2014, the Indiana Legal Services created the Consumer Advocacy Project to help Hoosiers either avoid this situation in the first place or assist in helping them escape these debt traps. Church and other community groups, like Brightpoint in Fort Wayne, may also be able to offer assistance. Although the latest attempt by payday lenders to unshackle themselves from regulation in Indiana has stalled for now, the assault on cash-strapped consumers continues. The payday loan industry is sapping Indiana communities of $70 million a year in fees. The biggest blow to consumers across America is the sudden about-face of the Consumer Finance Protection Bureau (CFPB), which as of late 2017 was preparing to enforce regulation that would have cut profits for the payday lending industry by as much as two-thirds. However, a change in leadership has put these changes in limbo, as the acting CFPB Director has now said he will be delaying the rules on payday lending created under the previous Director. In general, if you finding yourself in dire need of a small amount of money, remember that taking out a payday loan may lead to even greater ruin down the road. Just don’t do it.